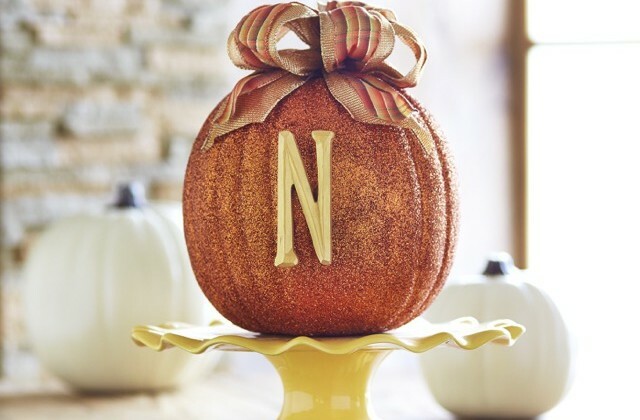 Personalize your pumpkin and make it illuminate before you light a candle with this glittery idea from Michaels. Paint the 4″ carved letter with the Metallic Luster. 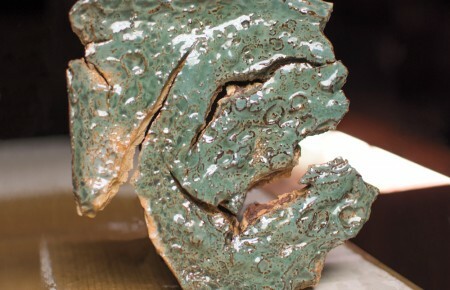 Let dry for 15 minutes. Tip: You can use a hair dryer to speed up the dry time. Create a multi-loop bow with fall ribbon for the top of the pumpkin. To do this, layer two sizes of ribbon on top of each other, keeping a tail about 6″ long. Next, make a loop with about 8″ of ribbon. Pinch and twist after the first loop and make another loop the same size on the other side of the pinched area, which will be the center of the bow. Continue making the loops until you have six loops, three on each side. Secure the center with a chenille stem. Cut the ribbon from the spool, leaving another 6″ tail. Trim ends of the chenille stem. Hot glue the bow to the top of the pumpkin and shape the loops as desired. Hot glue the letter to the front of the pumpkin.